Beyond Custom Guitars (www.bcguitars.com) is the palette of Florida based fine artist/painter Shadoe McKee, who specializes in custom graphics for guitars. You give Shadoe your ideas and she helps duplicate the concept on your guitar. 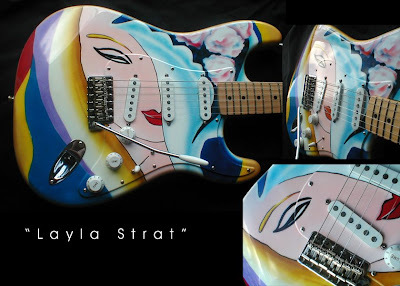 Our featured "Layla Strat" (click on image for better look) is just one of several gallery examples which span a diverse range of subject matter, style & techniques. Everything is hi-end quality work! 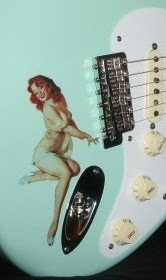 Those acquainted with Pamelina H., who does most of the Fender Custom Shop graphics, i.e. the calendar pieces, etc., will find Shadoe McKee's work of comparable quality. bcguitars.com provides all needed details & contact info. for anyone considering a custom guitar art work theme. Here's another avenue for personalizing or "unique-izing" your guitar, besides doing the relic route or sticking on a pin-up decal. The possibilities are limitless.